Croota underwear has listened to its customers and has re-released two of its most popular underwear ranges as part of its 2014 rollout of products, which will soon also include tank tops. Known for its comfort, fit and style, the California-based underwear label is heating up men’s underwear drawers just in time for Spring with its ‘Pattern Breaker Hipster’ range available in two colour options, along with its ‘Croota Through’ range. Croota’s ‘Pattern Breaker Hipster’ (pictures above) was originally released in 2012, providing guys with sophisticated designs in both purple and black options. Its pattern was inspired by the stars of the Australian flag, as well as Croota’s unique star logo. 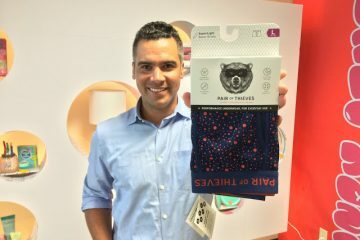 The combination of waistband materials, including satin and polyurethane, was the first of its kind, and remains rare among underwear brands on the market today. A partial and breaking silver satin logo found along the elastic band are the hardest techniques for manufacturers to produce, but Croota is known for its quality and had no issue in re-releasing this range for its most die-hard customers. The ‘Croota Through’ (picture above) low-rise hipster range was first released in early 2011, but still features a sporty square-cut and body-hugging design. Made from high-quality cotton that feels great against skin, the mixed cotton and satin waistband complements the brand’s unique dedication for all-around comfort. The range, which was even featured in a photo shoot with Russian Regional Freeski Champion, Artem Chu Glebov, is available in its original navy color and orange waistband. Both ‘Pattern Breaker Hipster’ and ‘Croota Through’ underwear ranges are made with 95% cotton and 5% spandex. Each range retails for $22.90, and both are available at www.croota.com.